← A New Crime in Translation imprint coming from Little Brown soon !!!! First he thrilled readers with a variety of supernatural thrillers and chillers, then he turned to a life of crime (fiction) and gained millions more fans with his detective, Roy Grace. 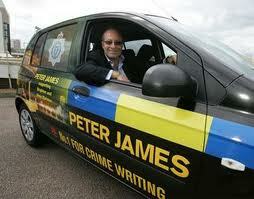 Peter James, Chair of the Crime Writers’ Association, is Special Guest at this year’s 10th Theakstons Old Peculier Crime Writing Festival in Harrogate – a long weekend of the best of the best in crime writing from around the world. His latest Roy Grace novel NOT DEAD YET is available in stores now, as is the paperback release of his wonderful standalone novel PERFECT PEOPLE. But, there’s a dark side to Peter’s fame as a star of the crime fiction world, check out this article which first appeared in the Daily Mail and is now online here.